Crispy, crunchy chicken tostadas are not only fun to make, but delicious, as well! 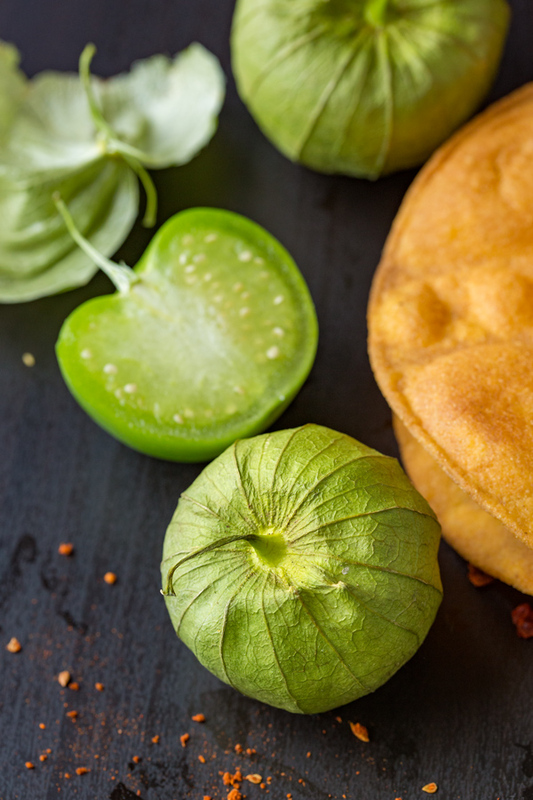 And when smothered in creamy mashed white beans, topped with a mildly spicy homemade charred tomatillo salsa, you’ve got a scrumptious tostada recipe with a unique twist. When my hubs and I go out to our favorite Mexican restaurant for a date night, we often split one of those huge orders of nachos that arrives in a cast-iron skillet. All bubbly and sizzling, they’re loaded up with all sorts of delicious toppings like refried beans, seasoned beef, and some spicy sauce or salsa drizzled over top—the spicier the better. We adore the crisp-crunchiness and south-of-the-border flavors to go along with our icy margaritas! But I’ve often been curious about the tostada offered on the menu—another crispy and flavorful Mexican morsel. 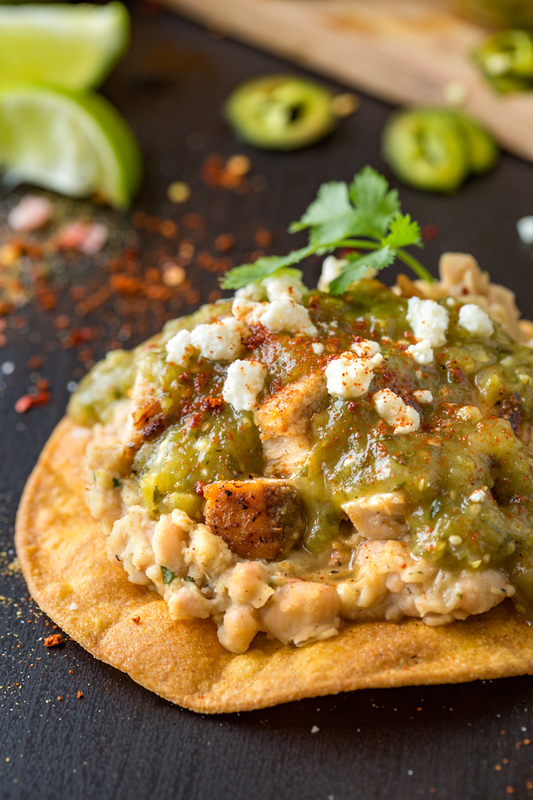 I’ve been thinking I could have some fun offering up my own take on this other crunchy treat by way of a tostada recipe with savory chicken, charred tomatillo salsa and mashed white beans. We loved these zesty chicken tostadas so much they may have just become our new favorite to go with our margaritas in place of those nachos (and we don’t even have to leave the house enjoy ’em!). You can certainly purchase the pre-made tostada rounds that are found in packages at the market for this recipe, but it takes no time at all to make your own freshly fried tostadas shells and to then layer them with delicious toppings. Homemade are so much more flavorful and crisp—nothing quite compares to them. Simply heat about ½ inch of oil in a pan or skillet over medium-high heat, then slowly dip one small corn tortilla a time in the hot oil, holding it down with tongs for a few seconds to help it stay flat, just until “set” on that first side. Flip over and crisp the shell on the other side for about 30-40 seconds, then flip back over to the first side and crisp for another few seconds or so; allow to slightly cool on a wire rack (you can sprinkle with a touch of salt, too). Next, layer on your favorite toppings, which in this case are creamy white beans that are seasoned and mashed to create that “re-fried bean” layer. Add the grilled and diced chicken, then smother with the homemade charred tomatillo salsa. Finish these delicious chicken tostadas with a final flourish of cilantro, cotija cheese, and anything else you’d like to add as a final dash of color and flavor. Make components ahead for ease: Since there are several elements to the recipe, make things easy on yourself by preparing the chicken breasts, the Charred Tomatillo Salsa and the Mashed White Beans a day or two ahead of time. Then, simply re-heat, and give your tostada shells a super quick fry to crisp up the day you plan to serve. Don’t be afraid to truly char your salsa veggies: When I prepared my tomatillo salsa, I cranked up the heat and left the veggies in the oven for 35 minutes to create a nice char. This tastes delicious when pureed in the processor with the remaining ingredients. Homemade is BEST, but go the store-bought route to save time: The flavors in the homemade Charred Tomatillo Salsa are absolutely delicious, but if you’re in a time pinch, feel free to purchase good quality salsa verde at the market. You can also buy the pre-packaged corn tostada shells. If you prefer; you can even dice up rotisserie chicken, as well. How to re-crisp your tostada shells: While best when freshly fried, tostada shells can easily be brought back to a crispy state by gently and quickly reheating in the toaster oven/oven for about 20 seconds—good as new! 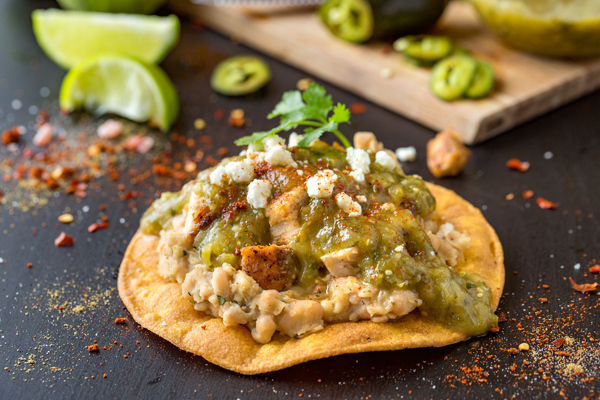 Freshly-fried and crunchy tostada shells are layered with seasoned and creamy white beans, diced grilled chicken and a smoky charred tomatillo salsa for a unique, colorful and delectable take on traditional tostadas. 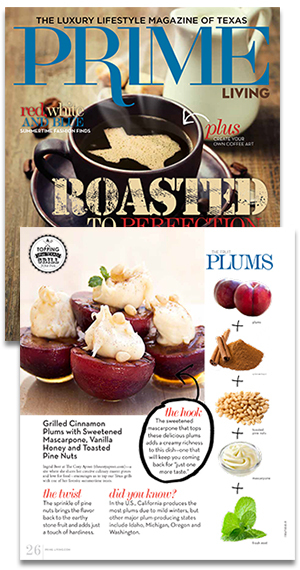 -Preheat your oven to 450°, and line a baking sheet with foil. -Prepare your charred tomatillo salsa by tossing together the quartered tomatillos with the remainder of the ingredients up to and including the pinches of salt and pepper, and char the vegetables for 20 minutes, then reduce oven temp to 400°, and continue to char for 15 minutes more; remove from oven and scrape all the veggies and juices into a food processor along with the cilantro, agave and water, plus a couple more pinches of salt, and process until smooth; set aside, or keep in fridge until ready to use. -While the veggies for the tomatillo salsa are roasting, prepare your mashed white beans by placing a skillet over medium-high heat; add in the oil, along with the garlic and pinch of red pepper flakes, and once aromatic, add in the beans along with a couple of good pinches of salt and pepper, the cumin, the chicken stock and lime juice, and simmer for 5 minutes just until slightly thickened; then, using a masher, smash the beans until fairly smooth/creamy, add in the cilantro, and set aside (or keep in fridge til ready to use). -Next season your chicken breasts with oil, salt, pepper and chili powder, and either grill or sear in pan for a few minutes per side, until cooked through; dice the chicken and set aside keeping it warm, or keep in fridge to ready to serve. -Finally, to fry your corn tortillas for the tostada shell, heat enough oil in a shallow skillet to be able to submerge your tortillas; once hot, add one corn tortilla at a time to the oil, holding down with your tongs, just until “set”, and flip to crisp the other side for 30 seconds or so; flip back over to the first side just until golden, about 30 seconds more; remove and drain on wire rack. 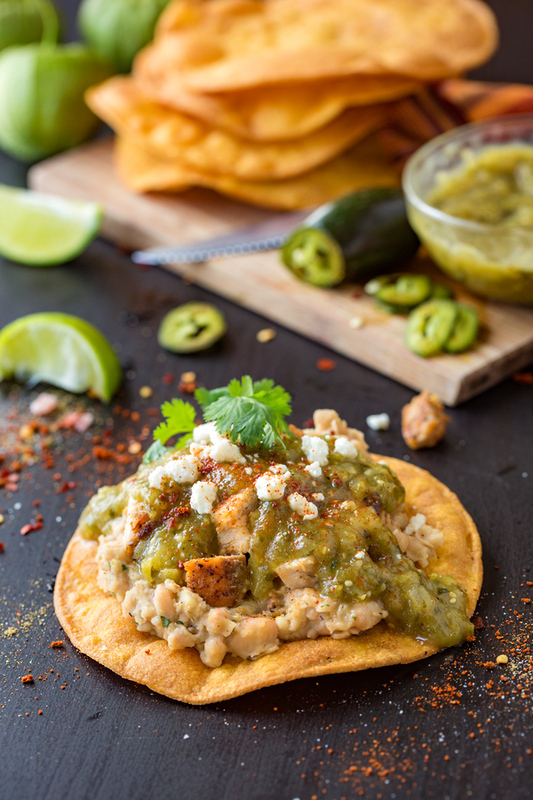 -Assemble the tostadas by layering on some of the smashed white beans, next some of the diced chicken, followed by some of the charred tomatillo salsa; then finish with a sprinkle of cotija cheese, some cilantro, and perhaps a squeeze of lime. And if you like this recipe, here’s another you may enjoy: Mini Mexican Pizza! This brings ways to top a tostadas to a new level. Flavorful mashed white beans and a tomatillo salsa. Delightful!